Working on a flour-dusted piece of wax paper, roll out the dough 3/8 inch thick. Use the cookie cutters to cut out an equal number of larger and smaller circles. 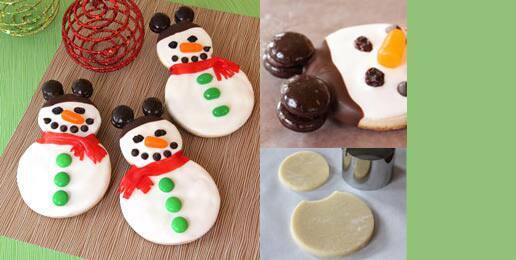 Assemble each snowman cookie by using the smaller cutter to cut a curved notch in the top of a larger circle, as shown. Then moisten the cut edge with a bit of water. Fit the smaller circle into the notch and gently press the dough together at the seam to help it stick together. Use a spatula to transfer the assembled snowmen to a baking sheet and bake the cookies according to the recipe directions. Allow the baked cookies to cool briefly on the baking sheet before transferring them to a wire rack to cool completely. Working with one cookie at a time, spread white cookie icing on each and gently press currant eyes, a candy nose, a chocolate chip grin, and candy buttons in place before the frosting sets. Set the cookies aside for a few hours to let the icing harden. Melt a handful of cocoa candy melts according to the package directions. Again working with one cookie at a time, dip the top of each snowman's head into the melted candy and then set it on a sheet of wax paper. For each ear, place two chocolate candies back-to-back and gently press them into the melted candy at the top of the head, as shown. As the candy melts re-harden, the mint ears will stick in place. Finally, cut a long scarf-length strip from the red fruit snack and fringe the ends. Wrap the scarf around the snowman's neck, crossing one end over the other to hold it in place.